The known Pinakbet dish in the Philippines has an Ilocano version. And during our stay in Vigan City, we were lead to the municipality of Caoayan, on a large hectare of land where a pavilion made of native materials sits near the river and where the ingredients for pinakbet are harbored. For an authentic Filipino dining experience complementing the rural landscape and the fresh air, diners are required to eat with their bare hands. We then checked the area as soon as we were settled to take the front seats since we were told that there will be a cultural show after dining. The nearby fishpond that runs through a river is open to visitors who would like to experience fishing. The vicinity is likewise surrounded by water lilies, where we were able to witness workers pulling some to be used as raw materials in making export-worthy slippers and bags. After a few minutes, lunch was served in a picnic style with banana leaves as service plates. For a reasonable price, diners can feast on grilled tilapia, chicken and pork, with the main entrée, pinakbet served on bamboo containers. A seaweed salad was part of the culinary treat as well. Pinakbet is a dish I am not accustomed to and will never eat when served with other choices in the likes of chicken and pork. The bitter gourd is what I hate most in this mix-of-vegetable dish. And so I tried. The verdict? Apart from bagnet that adds a contrasting taste to the bitter gourd, the bitterness was quite tolerable and the mix of all the other vegetables complements each other, without one ingredient’s taste being dominant. It’s an equal participation of all the vegetables to make up one outstanding cuisine, I so confess. Pinakbet is not hard to love. As of writing, pinakbet served at the Pinakbet Farm is truly one of the best I’ve tried, without exaggeration. After the servings were all gone into our stomachs, we were then entertained by the staff in a form of a cultural presentation. The show presented the way of life in Ilocos Region and the transition from courtship to marriage of an ordinary couple in the form of song and dance numbers. The song’s lyrics reflect the Philippine northern region’s virtues of patience, perseverance, industry and resilience. Twelve set of songs, mostly in Ilocano dialect, were portrayed commencing with no other than the Pinakbet Song. Other songs were: Ti Ayat Ti Maysa Nga Ubing (The Love of Youth), Manang Biday, Pamulinawen, Hello Love, Abalayan, Isem (Smile), Dungdongwen Kanto, Dance Sequence, Pada-padakam, Awitin Ko at Isasayaw Mo, and Kahit Maputi Na Ang Buhok Ko. In a more interactive dining experience, diners can participate in the cultural show as well. To the tune of Isem (smile), part of the wedding ritual is showcased, where the newly-wed dance to the song and encourages relatives and friends to share in their future by giving them something to start with, preferably financial support. At this point, guests can pin paper bills to either of the couple. 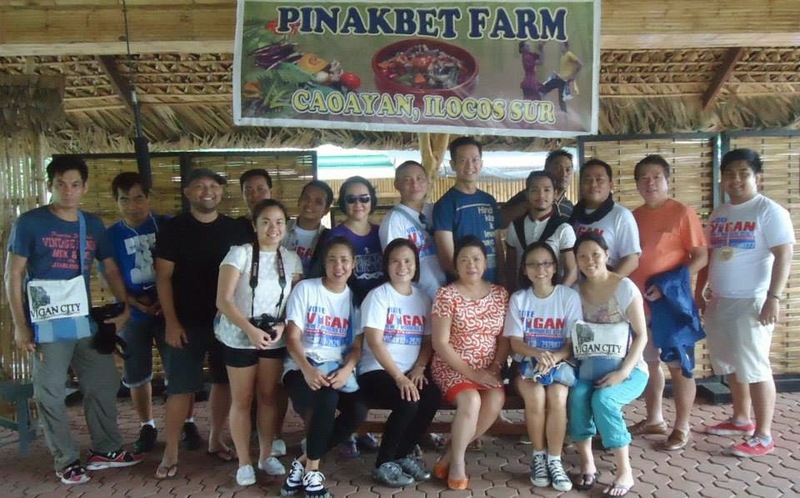 We were joined in this pinakbet experience by the Mayor of Caoayan, Hon. Germy Goulart and our host for this event, Jose “Bonito” Singson Jr. The kind mayor shared to us their plans and vision for the municipality in reference to promoting tourism and local products to all visitors, and even awareness campaign within the local residents. It is not every day that I get to eat pinakbet with the head of the town, which makes the experience even more memorable. Pinakbet Farm is truly one destination one should not miss when visiting the province of Ilocos Sur. A healthy lifestyle and environment is what it promotes and so as the rural landscape that those tied in the corporate world seldom experience.